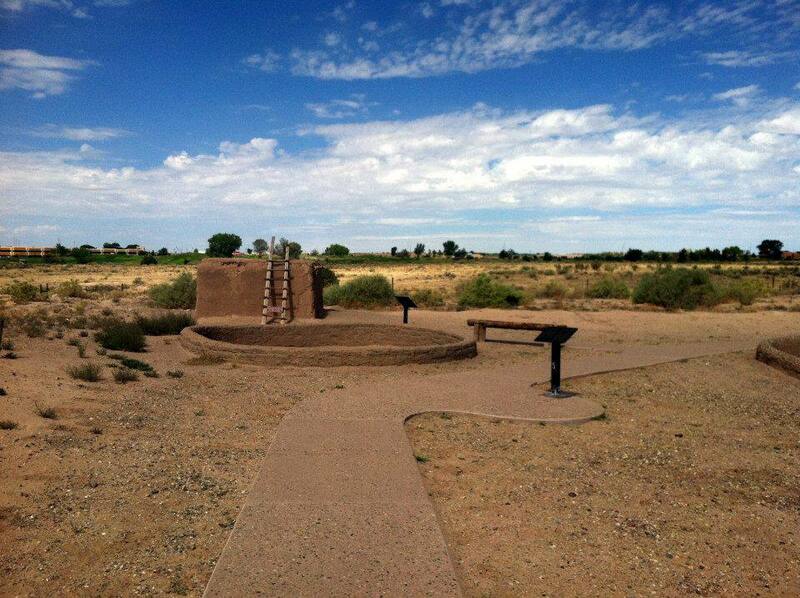 Coronado Monument lies just minutes north of Albuquerque in Bernalillo. The site features some of the preserved ruins of Kuaua Pueblo. The monument lies just west of the Rio Grande, along the Rio Grande bosque. The monument contains a visitor center with historic background, a picnic area and the remains of the ruins. When Coronado was searching for the Seven Cities of Gold in 1540, he traveled to the Rio Grande valley and was near the site. Rather than find treasure, however, he found instead twelve prosperous Indian villages. The villages spoke Tiwa. Coronado called these people the Pueblo Indians, Los Indios de los Pueblos. Coronado's entourage visited all twelve of the Tiwa villages over a two year period. While he did so, he relied upon the Indians for food and supplies. Kuaua was the northernmost village and was first settled in 1325. Kuaua means "evergreen" in Tiwa. Visiting the site today, it's easy to see why it was called that. The vegetation along the bosque is lush. The village was abandoned when Coronado and later Spanish explorers clashed with the native people. Today, the descendants of the Kuaua live in Taos, Picuris, Sandia and Isleta, the remaining Tiwa speaking pueblos. The Kuauans built multi-storied adobe villages in the 1300s. By the 1500s, when Coronado came, the pueblo had 1,200 rooms connected together to form a pueblo (the Spanish word for town). The Kuauans hunted deer, elk, bear, antelope and bighorn sheep. From the animals, they created food, clothing, blankets, and ceremonial objects. Men hunted and women gathered plants for medicine and food. The Rio Grande provided food, and water for crops that included beans, corn, squash and cotton. Ceremonies took place in the underground kivas. Interpretive trails provide information about the pueblo. The kiva at Coronado contains images on the walls that depict animals and people who were important to them. Visit the kiva by taking the ladder down. Allow your eyes to adjust to the dark, and see the pictures for yourself. In the visitor center, see some of the drawings that have been preserved for observation today. The Kuaua Mural Hall housed 15 panels of the original murals that were excavated from the rectangle kivas. The Children's wing depicts the history of central New Mexico. Kids can try on a conquistador's armor, or grind corn on a slab with a grinding stone. There is a ramada with seating for those who want to sit for a while, or bring a picnic lunch. It is right of the interpretive trails. The monument has a spectacular view of the nearby Sandia Mountains. Coronado Monument has several annual events. In October, the Fiesta of Cultures recreates life in the Spanish colonial times and features Native American arts and crafts. There are reenactors, blacksmiths, potters, flint knappers, and Butterfly Dancers. In December, the Lights of Kuaua takes place. This winter celebration features Native American dancers and a bonfire in the ancient village, as well as over 1,000 luminaria lights. Children's activities and food trucks are also on hand. Lectures also take place at the site, with topics that include Reconstructing Kuaua and Native American Easel Art. Learn about the history, archaeology, and various places of interest in New Mexico. A visit to Coronado costs $5. However, admission is free to New Mexico residents on the first Sunday of each month. Children 16 and under are always admitted free of charge. Seniors are admitted free on Wednesdays (with ID). Combo tickets for Coronado and Jemez are $7. To find out more, visit the Coronado Monument online. Why Is Albuquerque Called the Duke City?